"Rhode Island, Vital Records Extracts, 1636-1899," indexed database and digital image, Ancestry.com (http://www.ancestry.com), Volume 3, "Providence County Births, Marriages and Deaths," page 50 (image 146 of 473), Simon Wade birth entry. The record above is from the published book that is in the Ancestry.com digital book collection. 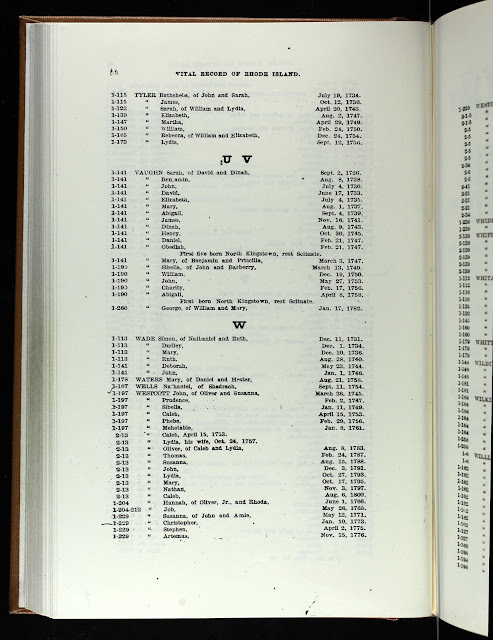 The numbers (e.g., 3-113) refer to the pages in the original Scituate town record volume, so 3-113 is Volume 3, page 113. I have not found those yet, but I'm pretty sure that they are on FHL microfilm. The same information is in several other indexes and compiled genealogies. This record is a Derivative Source (since the Original Source is the handwritten town record book), with Primary Information and Direct Evidence for the birth of Simon Wade to his parents. Simon Wade (1731-after 1800) married Deborah Tracy (1731-after 1800), and they are my fifth great-grandparents. I descend through their son, Simon Wade (1767-1857).